Street art has gone mainstream. Artists who started in the street now show in museums and galleries (rather than on them), and their stencils or posters can be worth millions. Cameras watch to catch not bombers putting up tags but people defacing what’s already on the walls. Just about every city in the world—as well as suburbs and deserts—has stickers, murals, and wheatpastes to admire. But what if it’s all graffiti to you? Here are 14 terms to know when it comes to street art. A stylized name or signature done with various materials, such as a marker or an aerosol spray can, often freehand. Depending on its format or complexity, a tag may be called a throw-up, as in “that throw-up is amazingly detailed,” not as in “this Sharpie scrawl makes me want to throw up my cookies.” A person who tags is known as a writer or bomber. Cute or creepy, cartoonish or realistic, a character serves as a signature or visual shorthand. If you know the character, you know the artist. Some artists take their characters from comic books or television, but many invent wholly original beings. A character can be put up on its own or as part of a larger narrative scene. Elaborate, interlocking letters or symbols used when tagging. Wildstyle forms a complicated code that excludes non-writers, as generally only experts or practitioners can read the name. A work done with a roller brush. Most rollers consist of block-letter tags or phrases, sometimes with drop shadows or intentional drips. The brush’s long handle enables artists to paint in hard-to-reach or tricky spots, such as down the side of a building, or to complete really large pieces. A group of artists who regularly get up together. The crew’s collaboration might consist of unified pieces that tell a coherent story, or it may be a series of individual tags done in a concentrated area. In recent years, property owners and even entire neighborhoods have allowed artists to bomb their houses or buildings. Legal walls have helped bring about the transformation of graffiti into public art. Because artists don’t have to execute quickly, at night, or with one eye out for police, legal walls allow for bigger or more involved pieces that seek to beautify, moralize, empower, or entertain. A huge work, often on a legal wall. It might be done by an individual, an informal group, or a crew. A mural might depict a single scene, or it might be a series of standalone or loosely connected images or characters. A site-specific work, often 3D or sculptural. 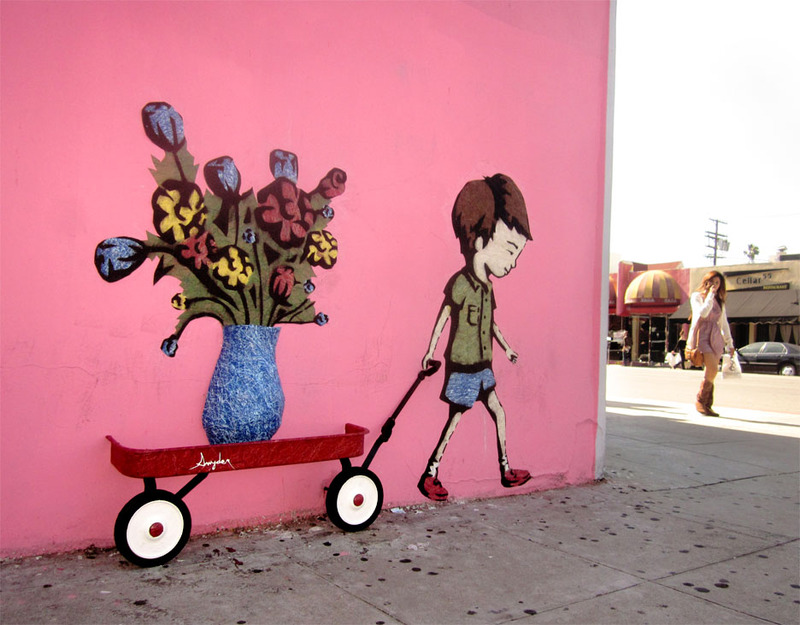 Temporary or permanent, an installation may combine several techniques, as when a stenciled scene of a child pulling a wagon includes part of an actual wagon attached to the wall. Some installations have a political bent, such as a street sign that has been altered, and some are optical illusions. Easy to make, easy to tote, and easy to place, a sticker is a fast, simple way to disseminate a character, tag, image, or message. The drawing or tag may be done quickly, on a priority mail label from the U.S. Postal Service or a “Hello My Name Is” badge, for example. Or the sticker may be designed and printed in a studio. Regardless, stickers show up on street signs, poles, doors, ATMs, walls, benches, subways, and pretty much every other surface you can think of. As with artisanal coffee shops, the presence of one in the neighborhood somehow beckons many others to follow. An adhesive made from equal parts flour and water; also the name for a type of street art that relies on it. To put up a wheatpaste, an artist covers an area with the paste, then unfurls a poster, drawing, painting, or photo made off site. After smoothing out the paper’s wrinkles and bubbles, another smear of wheatpaste goes on top. The result is sometimes called a paste-up. A design cut into heavy paper or cardboard, then spray-painted onto a wall. A stencil may be a phrase, an image, or a combination thereof. Some stencils are one-offs; others are repeated throughout a geographic area or around the world. Blek le Rat, the so-called father of stencil graffiti, popularized the form via images of rats he began putting up in Paris in the early 1980s. In 2005, Magda Sayeg knitted a cozy for a doorknob at her Houston boutique, and spawned a movement. Since then, knit bombers have covered statues, buses, signs, trees, grocery carts, telephone poles, benches, and other objects both sentient and non. Also called “grandma graffiti,” yarn bombing brings an element of domesticity into the streets, counterbalancing the traditionally male world of street art with a traditionally female art form. Another name for street art. The lines between graffiti, street art, and public art have begun to blur. As legal walls have proliferated, street artists are no longer marginalized, but are lauded for their creativity and craftsmanship. Perhaps in response, they have pushed past spray paint, stickers, and other common approaches. Today, work on the street encompasses a fantastic range of materials and styles from LED throwies and light projections to skywriting to abstract collage. All photos by Flickr user Garrett Ziegler.